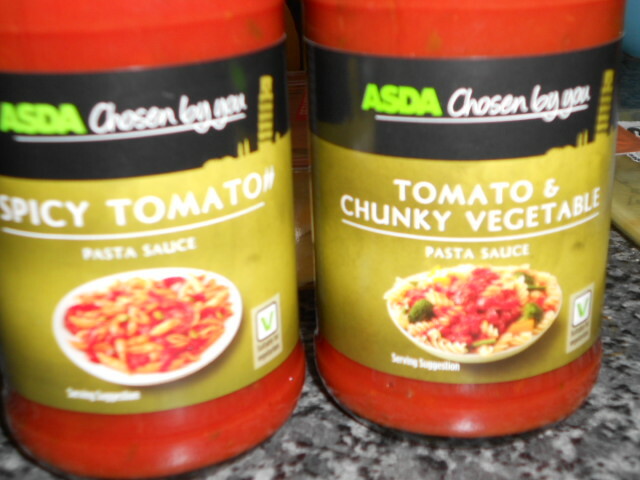 My children are all passionate about pasta, but sometimes it is great to have a change from bolognaise. 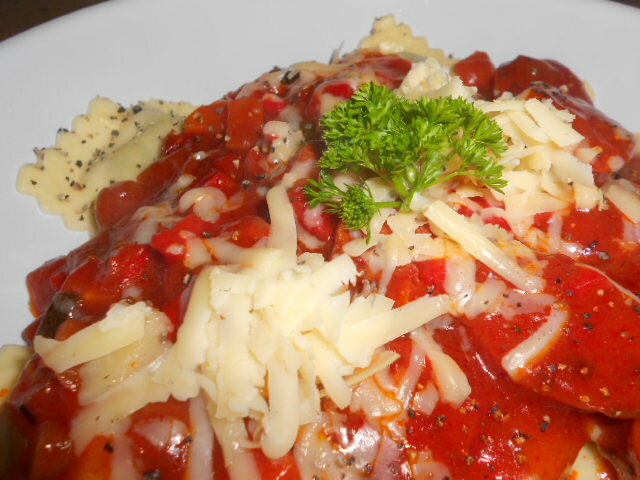 This is a bit of a cheat but it is quick, easy and incredibly popular. 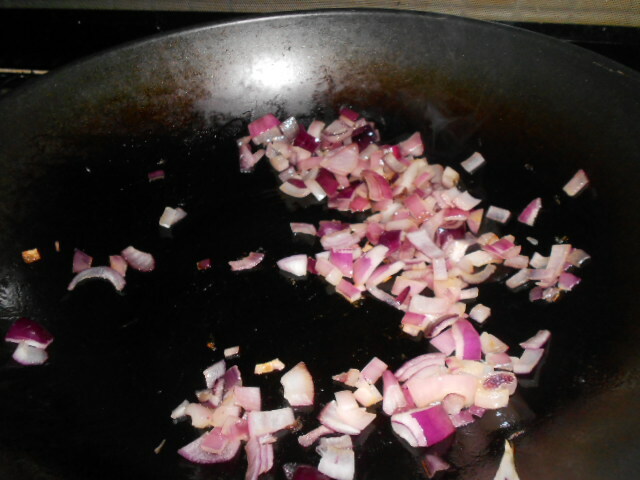 You need the smallest amount of oil just to get the onions starting to sweat. Add in the chopped peppar and let them begin to cook stirring for only about 5 minutes. 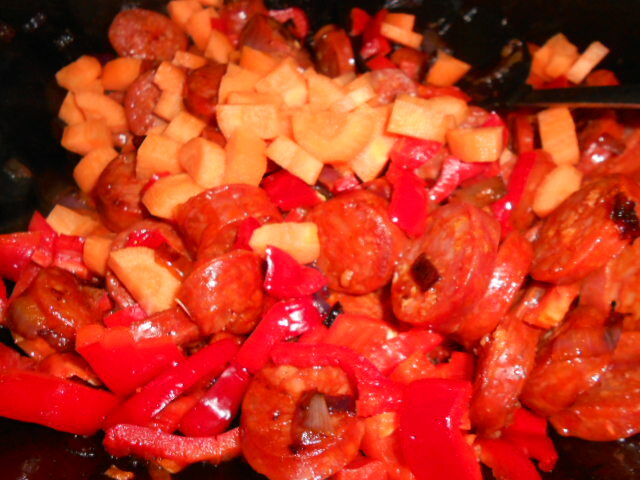 Add the chorizo to the pan and cook till the chorizo is browning, turning occaisionally. Then add the jar of sauce. As I am feeding lots of hungry boys I used two small jars of different tomato sauces and rinsed them with a small amount of water. Bring to the boil whilst cooking the pasta. I start to let the sauce really thicken before serving. 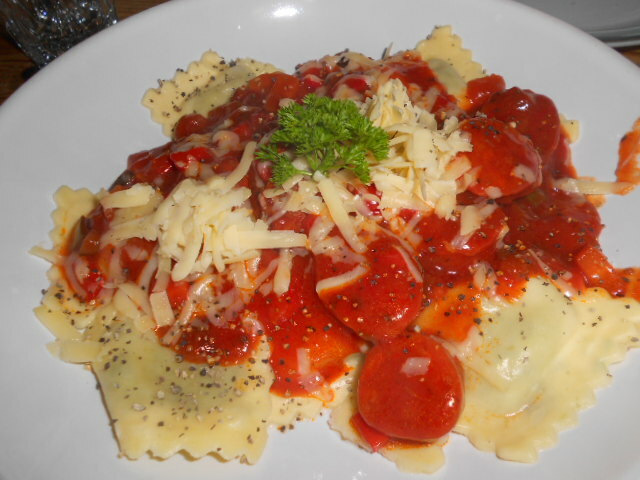 In this case I used a fresh spinach ravioli so layered them on the plate but normally I use a dried pasta and mix it in to the chorizo pan before serving. Serve with cheese, fresh bread or garlic ciabatta and a green salad. This is fantastic as you can add peas, sweetcorn, mushrooms, even extra tinned tomatoes into the dish or as I often do spinach leaves as you bring it to table. This is a great way of getting the children to eat some vegetables without serving any. It is a really popular meal on our table and so easy to add to if you have an unexpected guest, just add an extra jar of sauce or a tin of tomatoes and you have enough to go round. Enjoy, let me know how the children like this one.